Bill Ryan (off camera): I want to ask one final question. What events can you expect in the next 4 or 5 years on planet Earth? Leo Zagami (LZ): Planet Earth in the next few years will see definitely some very big events. Starting from 2010 which is the end of a 13-year cycle, we will have some great crashes, especially in the economic field. And this will lead to, also, an oil crisis in the year 2012. There will be some triggering moments that really will change also the way we live in the next few years. Because at some point-- if they lose control of us-- then the war will start, a civilian war, a counter-insurgence. But this, at the moment, seems to me very far from it because the majority of people out there are quite happy with their technological gadgets that give them the possibility of this modern life that they think is WOW, is incredible and that is bringing to them some advantages that their ancestors didn’t have. Well it’s all rubbish. We’re actually polluting our food, our food tastes rubbish compared to 50 years ago. If you want to buy good food you have to buy the organic one but you spend four times as much. All of this is made to make cash and at the same time to make us spend more money. And the quality of life is not necessarily increased with the fact that I have the internet or I have the phone, I can call all over the world. Who cares if you can call all over the world? Kerry Cassidy (KC): OK. But you are saying that there will be a change in consciousness. That it is anticipated around 2012. 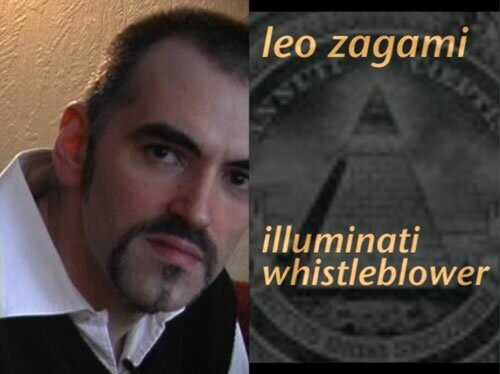 LZ: I think what we will see, at least in the Illuminati, from my experience, what they will see, in their eyes, is that they have to implement the End of Times scenario with a messiah, with somebody that can take the place of a guiding force for some spiritual arena. Because, you see, if I reveal to you the next stage of mankind in science – and this next stage in science is linked with the spiritual – that’s when the material guys want to have control of the spiritual completely otherwise they will lose their power over humanity. So that’s why they’re preparing this holy charade, you know, where every now and then we have more disinformation. Like, for example, Dan Brown. Dan Brown is the king of disinformation, you know? I still have part of the Knights Templar that is connected to me and is in favor of what I’m doing, though it’s a minority with respect to the majority of the members. KC: OK. A scenario for the future, like 2012, that the Illuminati has-- what their plans are? LZ: Yes. The calculations are that after 2012 we’re going to have 7 years of tribulation -- this really brings us to 2019-- the 7 years of tribulation in which we will have the coming of the messiah. Now you have to understand that the coming of the messiah has been, in a way, opposed and that’s why the Jesuits control the astronomic and control very closely the stars in order to know where any possibility of the rebirth of Christ might occur, of the rebirth of Jesus within certain bloodlines. So they have been searching these bloodlines, tracing any possible heir to this throne which is the throne of the kingdom of God on Earth. And they have made extensive research upon this. KC: Yes. So the messiah… he has to already be born now if he’s gonna even, you know, talk to people. He can’t just be a child in 2012. KC: And Jack Parsons, right? LZ: Jack Parsons tried to make the anti-Christ more than making the messiah [laughs]. KC: Well, the child, you know… right? BR [off camera]: Is it already known who this messiah is? LZ: You have the messiah and then you have the anti-Christ. KC: Do you believe this? LZ: [long pause] I believe that the scriptures contain an amount of truth because, you see, within certain families, within certain bloodlines, then it reoccurs that certain people have the possibility to have a message that is important for mankind. This happens to reoccur from time to time in certain families. Now that’s also where the study of the eugenics, the study of the bloodlines, and that’s where the mixing of the bloodlines…it’s very important for the Illuminati to create strategic alliances. Now the biggest strategic alliance that could be created at this time is a strategic alliance that would require unifying the Knights Templar’s Christian alignment with the Muslim Knights and their own alignment to their own End of Times and the mahdi. So the coming of the mahdi, so the coming also of the Christ-figure for them at the End of Times, is actually something that occurs in the Koran. So the holy text [unclear: Don De Fe]. And the same for the Jews. They also have a specific, you know, idea of what the messiah should or should be not. But in any case, Aleister Crowley announced that the messiah could, would not be, in any case, Jewish by birth, “pure Jewish” as they would say, you know? And also they would love to take the 'mick' out of the head rabbi in New York. Telling him: "OK."
But I also tell you he was not the anti-Christ, because he was the big [inaudible]. An anti-Christ will come, there will be a false prophet. There will be certain characters. I think that during the course of times, characters happen to reoccur. So we have many anti-Christs, many false prophets. But at the End of Time you have a very strong reflection of it. KC: You’re talking about analogic thought. KC: And is not the bible and is not some of this philosophy of the Illuminati much more analogy? You’re talking about the coming of a Christ consciousness but not necessarily a Christ figure. LZ: But for the Illuminati the important thing is to mix the two things, to have the Christ consciousness inside a human being that can be a manifestation of that consciousness. KC: That they can control. LZ: No. Well, they would like to control, but God doesn’t ever let things happen in the traditional way as mankind likes to always take control and hopefully, as I said before, they would like to even control if sometimes if there is the birth of something dangerous to them, they try to eliminate it, so they don’t have any problems. And that could be, for example, when Princess Diana was having her child from Dodi Al Fayed. See, that would have created a problem – Muslim into the holy Christian background of, you know, this reigning family, which is one of the most important we have in the “Sacred Roman Empire” bloodline, which is the British royal family. So that would have been very difficult. What I said before, the solution, the mix of the blood, they mix the Christian, mix the Muslim, but the Muslim has to be the descendents of the prophet Mohammed, so a specific bloodline has to be captured for that operation. KC: So are you saying this person has been chosen and the birth has already happened? LZ: These things are done between people who don’t talk much and they don’t talk because if they talk, mankind will always say: "Ahhh …. It’s not true; I don’t believe in this, I don’t believe in that." It’s not a matter of discussion for the Illuminati because we know from inside working with these things that this is not a matter of assumptions, it is a matter of science. So if you do certain operations and the result is correct, mankind can’t do anything. LZ: Nah nah nah… that is the antichrist. LZ: I can create the antichrist with genetic engineering. That is not a problem. That is very easy. KC: But you cannot create a Christ. KC: Do you believe such a thing will happen? LZ: I believe it definitely will happen. KC: OK. The Illuminati definitely believe this. KC: Are you saying the hierarchy is a bloodline, you believe in this even though you left the Illuminati? KC: Well isn’t it true that this is going to be the nature of anyone who comes forward anyway? LZ: He’ll be locked up. After two minutes his secret will be judged as dangerous. BR [off camera]: Is there a control scenario to reduce the world’s population drastically? LZ: You see, there is another thing that definitely is to do with the resources more than to do with … Objectively, the Illuminati wants to do money on us. They are heading the corporates, the secret societies, are making business on us. So for them, they don’t have a program to eliminate us. But the problem is the heads of the whole thing. When they see that there is missing the resources for all of us to be living at the same time, then they have to eliminate parts of the population. In that case, they bring in the weapons, they bring in the wars that can make sure, or the disasters, that can make sure that the population gets decreased. BR: Is this in progress at the moment? LZ: You asked me before about the underground bases and my experience is that they actually not only exist, but they are being held for maybe an upcoming scenario which is going to be apocalyptic. There seems to be in the Illuminati a firm belief that the coming back of Christ will coincide with a series of disasters that will change the face of the Earth forever, including the possibility of the elimination of ¾ of the population of mankind. But this is not Man who is deciding this. This is only God that can decide this. I hope that they will make clever use of these bases. But they are being really evil. They are even stationing the seeds of the future generations in a base up north. They’re doing obscene things that in the eyes of God are an insult to anything. I want to say, the solution will come at the end, but these people will be defeated. And they will be defeated with a long war. But this long war… Unfortunately for the Americans, will have to be fought and many lives will have to fall for it. So, we can’t fight a war without dead people on the ground. At the end, there will be a war and there will be dead people on the ground because the moment they want to microchip me, I’m gonna take out a gun and shoot at them. [laughs] That’s the thing, you know? It’s time to be a bit realistic. In this conspiracy movement, we haven’t seen sometimes much realism. How we embrace the future? I have people, patriots, from America calling me every two minutes: "Are we already here? Are we this, that, weapon we have, we’re building a big bunker here, another thing there. We are ready for this." Ready for what? You are a few hundred people or a few thousand. OK. You can have an enormous stash of weapons preparing for an Armageddon scenario but at the end of the day it’s worth nothing in front of the fact that we have the military here involved, the weapon dealers, the occult. People don’t even know what the occult is. I don’t need to talk with people who don’t know what the occult is. What is that? This is the organization for the methodical sale of weapons. How they have to be sold, when they have to be sold, when they are to be built and how they have to be developed for the selling. Then, you know, the old weapons always go to the African countries. We always give them a couple of old weapons. BR: As you now, we’re also here to meet with our Norwegian politician contact who went on record to talk about the involvement of Norway and the Norwegian politicians in some kind of scenario. Are you able to say anything to substantiate his testimony? BR: Because he stands alone at the moment. A lot people say that either he’s inventing it or that we’re inventing it. LZ: Well, what I can say is, from my own experience, underground bases exist. BR: He said he could name the bases. LZ: Definitely there is bases here. I mean, there is a base in Oslo for over 2000 people. The entrances are in the west side of Oslo, in [inaudible]. There are some entrances toward the port in Trondheim. This is underground bases that are being constructed to protect the population in a situation of emergency. That is without no doubt. And at the same point, as I said, for various experiments, and to keep the gold. Because gold seems to be at the End of Times, if all the banks fall and everything falls into chaos, gold seems to be this hard, consistent currency that can be used for money. Now, Norway has been for many years this kind of special deposit for money, this oil tax they call it, for a big deposit that needs to protect them for the times in which that finish their resource. That is the official, you know, statement. "Why are you putting all this money aside, taxing the people like heck, making us live in this way?" In Norway, everybody could be a millionaire, you know, if they released the money from the oil they are getting. But instead it’s not like that. We are living… some people in Norway are even living on the verge of poverty because these people have to build the bunkers, have to construct all this… And at the moment in Norway, the military are increasing their line of control over people, over the technology. I have personally experienced the police. I have informants in the police at this moment of time that told me how they are developing and how they are working with ultimate technologies to control us. They are listening to us now. They are controlling every single moment. And they are able to now... on the verge of the revolution of the microchip, which is truly revolutionary for them, because at that point, the moment in which they chip us, then they can let the resources fall apart but they still have control of us. The cities can get out of control, can fall, the whole structure can be destroyed but we will still be monitored from the satellites. That is something we have to keep in mind. So the moment of disaster for them is also the moment when they will have to keep control of the loose cannons running around otherwise there will be definitely the possibility of a true insurgence. So here in Norway we have already a passport with microchip. I don’t know if you have noticed it, if somebody has showed it to you. LZ: But Norway is, like all Scandinavian countries, the one that in the Illuminati experiment represents a timer. Also regarding the mixing of races. For example, for a period of time – it is well known also within the NATO reports – that these countries specifically were kept out of contamination of immigration because their bloodlines had to be kept “pure,” you know. Great. Well, always to do with the bloodlines. Now the bloodlines are mixing up. The scenario is lost. We have, those still in Norwegian Freemasonry, a bunch of degenerate Christian fundamentalists who are also Nazis, from my own personal experience. They say that in the war they fought the Nazis and they were great patriots and actually Himmler made a museum there, where you saw today the Grand Lodge, for a period of time to show how these people were… OK, this is a museum of the Freemasons who are controlled by the Zionists and are parts of this establishment. But they forgot to say that the Freemasons are actually controlled by the Vatican. The most enlightened brother of the Red Cross in Norway is the lowest degree who is linked to the Vatican and is approved by the Vatican. Because this kind of Freemasonry is actually officially approved and every single ritual has been read because of the high content of esoteric knowledge, the Swedish system needed to be approved by the Vatican, because they have to leave the last blessing on top of this system. So a Freemason from France, an officer from France, went with all the rituals to the Pope and showed the Swedish Rite rituals and said: "You approve, Your Excellency, this ritual," etc. He approved. That’s it. So if he approves this bunch of pagan, Egyptian nonsense and these kind of things, what kind of world is this? It’s a hypocrite world, where on one side they’re claiming to be monotheistic and believe in one God. On the other side they’re worshipping all kinds of gods. There is definitely a clash. LZ: Berlusconi is a well known P2 member. KC: He’s trying to come back into power, right? In Italy? LZ: He’s going to be back into power probably very soon. There is no alternative. Because there is no... because the church make this government fall down. And why is that? Why is it Prodi is now saying: "I’m going to take care of my grandsons. I’m leaving politics?" Because he did one wrong thing to the Pope and the Pope, the week after, make the government fall down. The Pope was supposed to have a lecture at the University of Rome, La Sapienza. This lecture couldn’t happen because of the opposition inside the university with all the people reminding, you know, that Giordano Bruno was burned on the stake, that Galileo was arrested, that a lot of things had happened. You know, that the Pope shouldn’t come to the Rome University right then. So he didn’t go. But the week after he managed, with the Christian Democrats of Mastella, to make the government fall down. And Prodi now is gonna go and play cricket, you know, or play golf or whatever. I mean, he’s not gonna be anymore into the field of politics. Because he rebelled once? Well, he created this possibility of the Pope not going to the University. That’s not [inaudible]. That shows you the power of the Pope. The Pope doesn’t have to talk much. Prodi does one thing wrong, he’s out, scrapped off the books. [inaudible]. Whatever. He can do whatever he wants – [makes whistling noise indicating quick departure]. Now? He's no-one. KC: So who’s coming into power in America? Do you know? Is it going to be Barack Obama? LZ: Now in the last few days, if you go onto the internet, you will see that Rense.com and other websites, Illuminatinews.com, have published an article where I state that Barack Obama is a Prince Hall Freemason, 32-degree Freemason, and also CFR member. He has written a big article lately on this Council of Foreign Relations. KC: OK. You said that earlier. But what about Hillary Clinton? LZ: But definitely McCain is not going to win. Why? Because Giorgio Balestrieri stated, he’s the Director of the Rotary of New York, this election, we support the Democrats. So Republicans are not in the least of support of the Illuminati. They can’t make it. McCain can climb walls, can do whatever he wants, he’s not gonna [unclear: be elected]. [Kerry laughs] Poor guy. KC: OK. Leonardo DaVinci. Was he a member of the Illuminati or no? LZ: Definitely [unclear] Illuminati, natural, you know. You can see he’s Illuminati. I mean, he’s Illuminati-- the whole concept around him, you know? The guy was a genius. The problem is, from there to make him the Grand Master of a Priory of Zion, is totally fictitious. What was the Priory of Zion? Priory of Zion was a society that was born in Mount Zion in Palestine where you have this Cathedral of Zion, whatever. And basically what happened was this. This order lasted for a very short period of time and people say: "Where is the Priory of Zion today?" Priory of Zion – if you go and search on the history books, has melted in with the Jesuits. It doesn’t exist anywhere. The other six Priories of Zion that exist today is on the internet or whatever Plantard de Saint-Clair has created. Plantard de Saint-Clair was the biggest piles of rubbish and fraud and an agent of the Illuminati because he was an agent of GLADIO. He was like Licio Gelli. He wanted to create great myths, which he picked up from his friend Robert Ambelain, from the Martinists. He picked up the myth. Well, obviously the Martinists had created this church. It was the Kabbalistic Order of the Rose Cross that had created all the esoteric parts of the Rennes-le-Château church with Abbé Saunière. He was a genuinely esoteric-interested guy. But all the rest is rubbish. Where he took all his money? Where? From the initiations that they were paying him because he was making that church profitable the moment in which he was inviting all these people to initiate themselves into high glorious rectified Scottish Rite, another peculiar Templar foundation of...that was created in a way mythological, fictitious, but had the ground of truth in it. The Priory of Zion of Plantard St. Clair is also Catholic. The oldest people involved… I have a personal… and I can show you documents involved with the Priory of Zion… The people involved nowadays: Gino Sandri, the secretary of Plantard St. Clair, was a member of the Monte Carlo Lodge. Gino Sandri is also one of the biggest intelligence crooks there is around. KC: OK. The CIA is completely run by the Vatican? Is that what you’re saying? LZ: [inaudible] The priests are all very [inaudible]. It’s all about working together. It’s not about running each other. Each other in their own… you know, “We take care of this”, which is the spirit of mankind, give a couple of blessings, PLUS you need to make some charity every now and then, tax deductible if possible. You have the church, you have all the organizations, you give the charity. If you give good charity you are a good man and I give you blessings. This is done also in the Russian Orthodox Church. Well since the fall of the Soviet Union you see these big priests going around with Mercedes, Limousine, whatever. Why? Because they are getting a bunch of money from these sinners of the Russian mafia who are sinning like heck, you know. They have six lovers, whatever; the wife’s there waiting, eh? But at the end of the day they give money to the church. That saves their… you know. Bill Ryan: At the front of the Jesuit [inaudible] there is a reference, not to the SIV but the SVS and Luca Scantamburlo did not know what that was and hasn’t been able to find out. Do you know what that it? The SVS? BR: Oh right, the secret service of the Vatican.